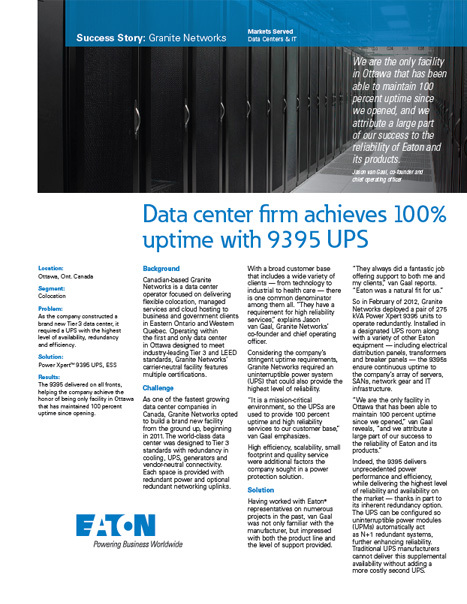 As the company constructed a brand new Tier 3 data center, it required a UPS with the highest level of availability, redundancy and efficiency. The 9395 delivered on all fronts, helping the company achieve the honor of being the only facility in Ottawa that has maintained 100 percent uptime since opening. As one of the fastest growing data center companies in Canada, Granite Networks built a world-class data center designed to Tier 3 standards with redundancy in cooling, UPS, generators and vendor-neutral connectivity. The company needed a high efficiency UPS to provide 100 percent uptime and a model that was scalable and had a small footprint. Eaton was a natural fit for Granite Networks. The company deployed a pair of 275 kVA Power Xpert 9395 units to operate redundantly.